Josie Steele (-57kg) and Alex Short (-66kg) ensured that GB Judo started the 2018 Glasgow European Open on a high as they finished atop the medal rostrum on Saturday 6 October at the Emirates Arena. A large home crowd ensured that all GB judoka received great support throughout the day with noise reaching a fever pitch during the medal matches. 18 year old Josie Steele was fighting at her first ever Senior world ranking event but she did not look out of place. The Highland Budokan judoka took London 2012 bronze medallist Automne Pavia (FRA) in the final and the French fighter’s experience looked like it would key. A hard fought contest went into golden score with Steele two shidos to one down and falling behind on attacks to Pavia. The British judoka stuck in the fight though and took her chance to throw Pavia for waza-ari, to the delight of the home crowd. Speaking after picking up her medal, Steele said: “It hasn’t really sunk in at the moment but it’s amazing to be finally on top of the podium at an event. Steele started her day with a solid win over Austria’s Asimina Theodorakis, a waza-ari proving decisive. She then saw off the dangerous Portuguese judoka Wilsa Gomes in the quarter-finals, throwing her opponent for ippon with just over a minute left on the clock. Her semi-final was an all-GB affair against Malin Wilson. Both judoka train together regularly and they cancelled each other out for large parts of the contest. Steele bided her time though and threw Wilson for waza-ari and finished the contest in osaekomi to set up her final with Pavia. Edinburgh Judo’s Alex Short had fought in the European Open in Glasgow back in 2016 but had never medalled at an international event before today. The British fighters had a couple of quick wins over Alister Ward (FRA) and Senne Wyns (BEL) to start the day. However, his next two contests were lung-bursting affairs, including a nine-minute fight against Andrej Klokov (LTU) in the quarter-finals. His semi-final against WRL 27 Kenneth Van Gansbeke (BEL) was another that went to golden score with Short throwing his opponent for waza-ari to book his place in the final. Short had fought his next opponent, Adrian Nieto Chinarro (ESP), at a team event so knew what to expect. That experience clearly helped as he threw the Spaniard for ippon with just 44 seconds on the clock. “I can’t believe it. It’s a really, really good feeling. Wasn’t really expecting it today. 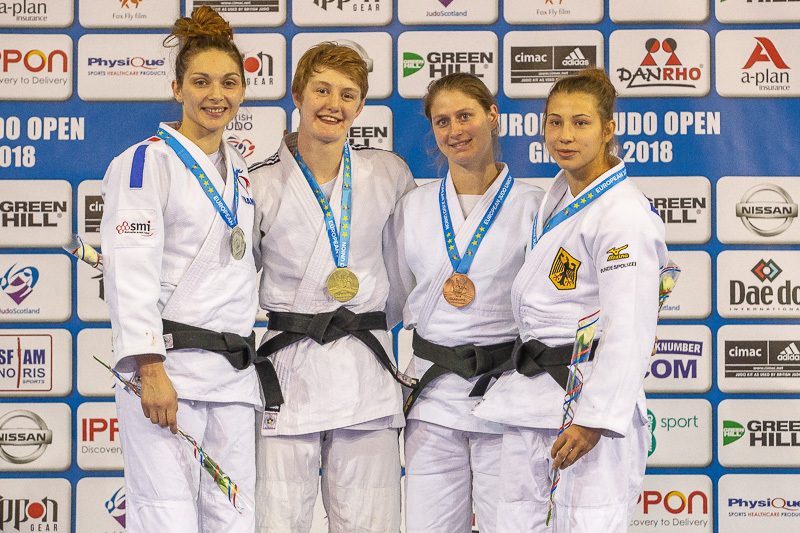 There were three fifth place finishes for GB Judo as well with Kim Renicks (-48kg), Malin Wilson (-57kg) and Lele Nairne (-57kg) just missing out on joining Steel and Short on the medal rostrum.